The goal of this project is to provide children and walkers a safe route to walk to Jackson Middle School. Currently, the majority of children in Markham Neighborhood that walk to Jackson Middle School walk along the 30 mph speed zone (recently changed from 35 mph) along 35th Avenue & Huber Streets where they must cross the busy intersection at 35th & Huber Street. Much of the road does not contain an adequate shoulder for children to walk safely when vehicles pass them and there are sections where children must walk in the street altogether. What parent would not want the safest route to school for their child? By using the City of Portland unimproved Right-Of-Way (ROW) along 30th Avenue, children bypass these streets and approach Jackson Middle School at 35th & Maricara Street where there is a school crossing with rapid flashing beacons in a 20 mph. school speed zone. Currently, a fence encroaches the City's ROW at the Northern entrance closest to Wilbard Street. Therefore, children are not able to access this safer route to school. MKNA has made multiple attempts to communicate with the homeowner to explore how the fence could be moved to provide adequate room for children to safely walk to school using the ROW. To date, MKNA has not been able to work something out where the homeowner retains the majority of his fence "as is" and a small section is moved to give children safe passage to school. Fence moved back at SW 30th & Wilbard. 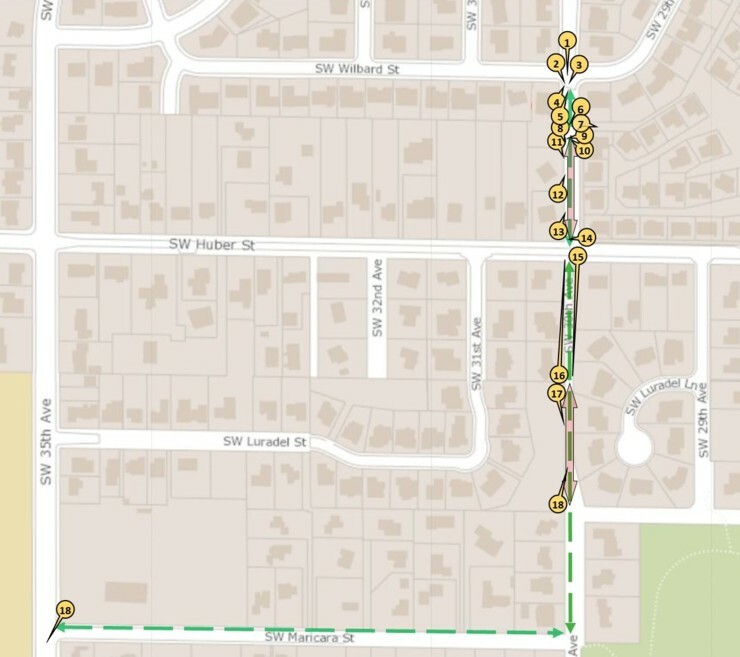 BOONES FERRY CULVERT PROJECT will divert traffic onto Stephenson and 35th Avenue thereby increasing the traffic in front of Jackson Middle School and the busy 4-way stop at Huber & 35th Avenue in a 30 mph zone compounding an already dangerous route for children walking to school. The project is expected to begin in the Spring of 2018 and last about 9 months. More information can be obtained by visiting the Bureau of Environmental Services (BES) webpage for the Boones Ferry Project description and Boones Ferry Culvert Project Map. Click on this map to view photos taken from the indicated locations.